1. Residual Moisture within the screed. 2. A friable surface caused by loose material or laitance. Screeds of this type are very sensitive to moisture and must be “dry” before any floor covering can be fitted. BS 5385 Code of practice for ceramic tiling states this should be 0.5% moisture content or less. BS 8204 Code of practice for pumpable screeds states that the residual moisture in the screed should not exceed 75% RM. It is therefore vital that the moisture content of the screed is checked and verified before any floor covering is laid. A failure to undertake this basic check will void the guarantee. It should be noted that any subsequent moisture penetration of the screed can cause damage as the screed can “soften” causing debonding. As this type of screed material cures it develops a smooth top layer. This is composed of loosely bonded particles that can appear to be solid and an ideal surface onto which to tile. Unfortunately it isn’t! It is weak and WILL break down causing debonding. 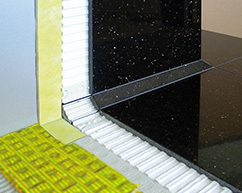 In order to fit CI+ matting onto this type of surface the following steps must be followed. This advice also applies to the direct fix of any Floor covering. In order to obtain a satisfactory bond of the CI+ membrane to the screed surface a moisture test must be carried out that meets the standards described above. The “loose” surface of the screed must then be mechanically scraped or scabbled. The soft material will be removed fairly rapidly until the hard solid core is exposed. This surface must then be treated with a primer as recommended by the adhesive manufacturer. This primer serves to protect the gypsum in the screed from the cement in the adhesive, preventing the formation of Etrinite crystals, which cause tiles to debond. 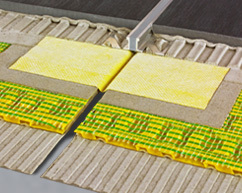 Once the surface preparation is complete the CI+ matting is fixed in the normal method. 1. The Mat is cut to size and put on one side. 2. A thin layer of cementacious tile adhesive is spread over the surface and the Mat is pressed firmly into place. Subsequent strips / pieces are laid abutting each other. Sealing tape being used if there is any danger of water penetration of the installation. 3. Tiling can take place immediately using a notched trowel suitable for achieving solid bedding of the specific tile. 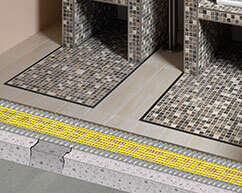 The installation should be completed using a flexible grout.